If you have a reef aquarium, that is a specialized type of saltwater aquarium, you must measure calcium and magnesium levels. Coral and other invertebrates with hard shells and exoskeletons absorb calcium and magnesium from the water column. If you keep such an aquarium, make testing for calcium and magnesium part of your regular aquarium maintenance. Test kits for calcium and magnesium can be purchased at most pet shops or online. These kits typically include a reagent, a vial and a color chart. While many of the specifics vary from brand to brand, they follow the same general procedure. First, collect a sample of aquarium water in the vial. Then, add a prescribed number of drops of the reagent. Hold the reagent bottle straight upside down to ensure uniform drops. Cap the vial and mix in the reagent by inverting the vial. Depending on the exact text kit, you may need to wait several minutes, or add a second reagent -- consult the kit's instructions for the specifics. Once the reagent has been allowed to sit for the prescribed length of time, compare the color of the sample in the vial to the color chart, which will reveal the levels of calcium and magnesium. Ideally, your calcium levels should remain around those of natural seawater. Calcium test kits usually display their results in parts per million (ppm). Natural seawater has a calcium concentration of 420 ppm. However, most coral and invertebrates can thrive at a level between 380 and 450 ppm. You have a much greater chance of seeing levels too low than seeing levels higher than 450 ppm. Reef hobbyists raise calcium with several methods, including calcium-rich decorations, like coral sand and tuffa rock; liquid supplements, like kalkwasser drips; and active equipment, like calcium reactors. 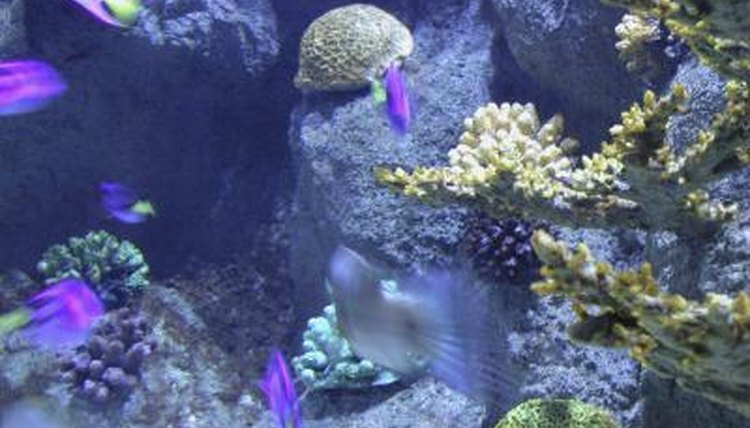 Magnesium serves several purposes in aquariums. First, corals and other invertebrates use it to metabolize calcium. Second, it interacts with aquarium water to make it easier to dissolve calcium into the water column. Like calcium, magnesium test kits generally give the magnesium level in ppm. Natural seawater has a magnesium level of 1285 ppm. Reef aquariums ideally need a level between 1250 and 1350, but levels between 1200 and 1400 ppm usually don't cause problems. Pet shops specializing in saltwater aquariums sell liquid supplements that can help maintain magnesium levels. Different experts have different recommendations about how often to test your aquarium. Aquarium Fish International Magazine recommends testing calcium monthly, and Reefkeeping Magazine recommends testing magnesium "occasionally," which you can interpret as quarterly. Keep in mind that such guidelines do not constitute hard, fast rules. If you see signs of low calcium or magnesium, you should test the water. Low calcium tends to produce symptoms in coral, including withdrawn tentacles and slower-than normal growth. If you see these symptoms with normal calcium levels, you should check magnesium levels, since many invertebrates cannot metabolize calcium without adequate magnesium. Additionally, in water with low magnesium, calcium tends to fall out of solution, so if you have trouble dissolving calcium in your water, test the magnesium levels.